Southern charm meet contemporary style. Welcome to Kimpton Brice Hotel a modern day southern belle that very well may change your perception of hotels in Savannah Georgia. Kimpton Hotel Brice boldly offers an inventive twist on the traditional lodging found throughout Savannah with a style that is metropolitan upscale and eclectic a dynamic reflection of the areas emerging social renaissance. Here you will enjoy the very best Georgias first city has to offer with an ideal downtown location just steps from iconic River Street in the heart of the nations largest historic district. 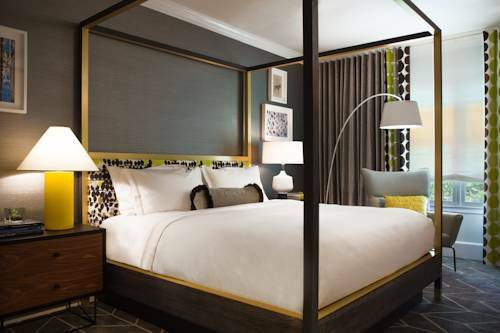 Kimpton Brice Hotel is a fresh slightly rebellious reflection of Savannahs emerging cultural renaissance. We offer a rich and eclectic experience that bridges history and tradition with a contemporary approach to Savannah hospitality and design. Located at 601 East Bay St -Houston St. and Bay St.- We are one street up from the Savannah River in Americas Largest Historic District. Situated on Washington Square one of Savannahs original live oak filled Spanish moss draped squares. The Brice is in the heart of all the history art music dining shopping and entertainment that the Hostess City has to offer.